At our practice, Dr. Cowell is committed to keeping himself, our staff, and our facility on the cutting-edge of dentistry. He’s constantly taking continuing education courses and integrating the latest technology into our practice so we can deliver even better results in less time. Thanks to this approach, we’re able to address and even wider array of problems and better explain your care while we do it. In the end, the services and technology detailed below only serve to improve your experience with us, and we know you’ll appreciate them at every visit. If you put your fingers right in front of your earlobes and open your mouth, you’ll feel your TMJs, or temporomandibular joints. These joints are what allow your jaw to move fluidly, and like other joints in the body, they can often develop issues due to strain, injury, or arthritis. This can lead to a wide variety of symptoms, such as a painful jaw, chronic headaches, and even neck and shoulder pain. Dr. Cowell is able to diagnose and treat these kind of problems right in our office so you won’t have to run around town looking for a specialist. Our Schick intraoral cameras give our patients the opportunity to see their smile from their dentist’s point of view! You’ll be amazed by how much you’ll learn about your teeth and gums just by looking at the highly-detailed images. 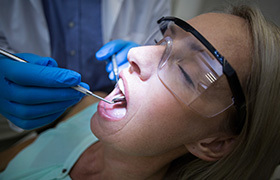 These cameras are small, pen-sized devices that fit easily into the mouth, and the images they capture can be quickly displayed on a nearby monitor for you to go over with your dentist. 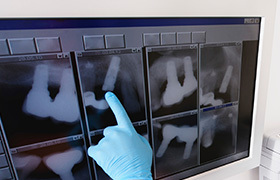 Compared to traditional film-based X-rays, our digital X-rays by Schick are a huge leap forward in every single way. They can create images much faster, they don’t require toxic chemicals to be developed, and better yet, they emit up to 80% LESS radiation. 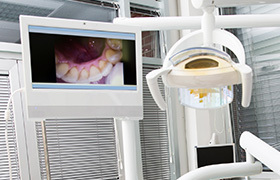 Plus, the images can be instantly displayed on a chairside monitor for you to go over with your dentist. For insurance and referral purposes, they can also be easily copied, stored, and sent infinitely as well.